Operating since 1986, Quasar Expeditions is the second-oldest tour operator in the Galapagos islands -- but the first luxury line there. 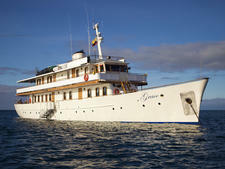 The line is also the first to offer professional diving cruises in the Galapagos. Grace's namesake, former owner Princess Grace of Monaco, gives the yacht a piece of its storied past, which also includes millionaire tycoons and a stint in the Navy. The 32-passenger expedition ship offers three suites, eight premium staterooms and five deluxe staterooms, all with private bathrooms; sails in the Galapagos. Boasting a more personal yachting experience that's less harmful to the environment, Quasar Expeditions touts an intimate and immersive cruise. A stringent waste-management program and state-of-the-art technologies for clean-running engines aid in Quasar's low-impact effort to preserve the environment. Its fleet boasts a small (at times two-to-one) passenger-to-crew ratio, exclusive Galapagos itineraries and highly trained onboard naturalists. Seven-night sailings in the Galapagos promise contact with a unique environment including land and marine life visits and glimpses into the geology of the islands' many volcanoes. Activities such as snorkeling, kayaking, scuba diving, dinghy rides and walks and hikes enhance the interaction. Naturalists onboard either of Quasar's yachts -- the M/V Evolution and the M/Y Grace-- are level 3 certified by Galapagos National Park and have at least 15 years of experience guiding on the islands. Their knowledge and expertise are enhanced by their individual interests -- from expert diving to birdwatching -- and their native connection to the region. A maximum of 16 passengers per naturalist is set for an intimate and enriching experience. Men and women between the ages of 35 and 65 mainly, from English-speaking countries such as the United States, Canada, Australia and the U.K. Important markets also include Hong Kong, Netherlands, Russia and Brazil. M/V Evolution -- The 655-ton, 32-passenger Evolution offers three suites, eight Premium Staterooms and five Deluxe Staterooms with private bathrooms. Passengers visit a common lounge with a bar and facilities for lectures, slideshows and films. A sky lounge on Albatross deck features another bar and plenty of room for relaxation with a view. You will find a Jacuzzi with lounge chairs for sunbathing and plentiful outside deck space at the bow of the ship. Inside and al fresco dining areas are available onboard, and breakfast, lunch and dinner are served buffet style. For family cruises, Evolution's Kids Club organizes activities such as star-gazing and movie nights, and child-oriented guides provide tailored learning activities and keep kids' expedition journals. A PlayStation console is available in the library as well as a wide range of board games and movies for children. Children's menus are provided during family cruises. M/Y Grace -- The 18-passenger, 291-ton Grace was built in 1928, and Quasar bought and refitted it in 2007. The yacht offers two Master Suites, two Twin Suites and five Premium Staterooms of up 200 square feet with private facilities. Public areas include a main salon equipped with a bar. Passengers can eat inside in the interior dining room or outside in the al fresco dining area. 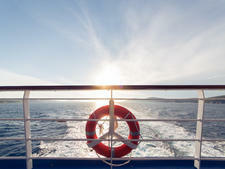 Passengers can relax in the front of the boat where the Jacuzzi and sun chairs are located. The sundeck has a bar with open-air seating. The line guarantees one naturalist guide for every nine guests on a full yacht. For family cruises, Grace's Kids Club organizes activities such as star-gazing and movie nights, and child-oriented guides provide tailored learning activities and keep kids' expedition journals. A wide range of board games and movies for children are available in the library. Children's menus are provided during family cruises. Both yachts in the Quasar fleet specialize in seven-night Galapagos sailings with Peru and Ecuador trip extensions available. Smaller ship size is a factor in site visits to more "fragile" locations around the islands. Both yachts have access to the northern Island of Tower, or Genovesa, which is off-limits to larger ships, and requires longer navigation. Private charters are available.